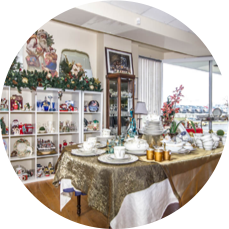 At the Boutique – volunteers play a big role in operating our boutique. Organizing and sorting, working on the cash, setting up display in the store, and helping our customers. It is a wonderful and fun environment to spend time each week. In our Adult Day Centre – working alongside our coordinator, volunteers work with participants, plan activities, organize outings, and spend time with a wonderful group of people. 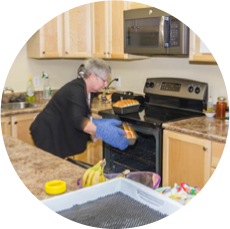 In our In Home program – volunteers spend time in the community with those still living at home. Activities and details vary but all are focused around supportive and caring relationships. On our palliative care floor – volunteers sit with patients, share musical talents, read, support nursing staff and interact with families. In our kitchen – the kitchen is a beehive of activity and our world class cooks can always use some extra support.